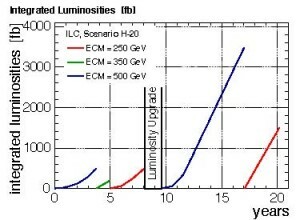 Predicted integrated luminosities for various centre-of-mass energies in the “H-20” running scenario for the ILC, which was recently adopted. In H-20, the ILC starts at a centre-of-mass energy of 500 GeV, followed by runs at lower energies. ILC operation is still some years away, but physicists are already gearing up to find the optimal way to operate the ILC to harvest as much physics as we can. One of the great advantages of the ILC over circular machines is that the energy of the machine is tunable, and can also be upgraded to higher energies by extending the accelerator later. The Technical Design Report (TDR) is based on the collision energy of 500 GeV, but can be brought down to lower energies. Even though it might sound strange to lower the collision energies, it is actually better for some physics goals. There has been an intense discussion about the so-called “running scenario” in the community. A specific scenario is also needed for studies of detector and machine performances based on a common assumption among the scientists. It may well change as the time comes close, or if LHC discovers new particles, but it is meant to be the “best educated guess” on the optimal strategy of the ILC at this moment. At the Asian Linear Collider Workshop at KEK, Jim Brau from University of Oregon presented three scenarios called H-20, G-20, I-20, together with the one used in the Snowmass study in 2013, on behalf of the ILC Parameters Joint Working Group. The new three scenarios are meant to be very realistic. The machine often takes time to be brought up to speed and deliver intense beams needed for physics. It does not run for the full 12 months of the year because of maintenance, beam studies, and for saving power. They assume the TDR-based configuration for the first ten years or so, followed by a major 18-month shutdown to upgrade the intensity of the beam. The total envisaged running time is twenty years. After many months of discussions, the scientists converged on the scenario H-20. It starts with the currently anticipated highest energy of 500 GeV, accumulating 500 fb–1 of data. And for the optimal studies of top quark and Higgs boson, the ILC will go down to 350 GeV (200 fb–1) and 250 GeV (500 fb–1), respectively. After the luminosity upgrade, it will run again at 500 GeV (3500 fb–1) and 250 GeV (1500 fb–1). This scenario is shown above. This running scenario guarantees that any new physics that may be within the reach of the 500-GeV ILC can be discovered as quickly as possible, while precision studies of the top quark and the Higgs boson maintain competitive edge to the High-Luminosity LHC that is supposed to be operating at the same time as the ILC. The proposed running scenario was approved by the Linear Collider Board. The proposed running scenario bodes well for precision Higgs studies and more. Now that we have the running scenario, scientists studied the performances of ILC physics with realistic and concrete assumptions. The simulated performance is very very exciting. In a recent paper (K. Fujii et al, arXiv:1506.05992), you can see that ILC can reveal the nature of the Higgs boson. One of the major puzzles about the discovered Higgs boson is that it is the only point-like particle we know that does not spin. It is out of context, a new breed. We would like to know whether it has siblings and relatives like in supersymmetric theories, or is it made of smaller constituents that do spin but their spins cancel against each other. Fig. 2 shows that the proposed running scenario for ILC can answer this question given its precision and powerful beams. In addition, this running scenario makes ILC possible to discover “invisible particles” LHC likely misses, or understand whether the heaviest particle we know, the top quark, is composite or elementary. What will happen after twenty years? It will depend on what we will find at the LHC Run 2, HL-LHC, ILC up to 500 GeV. The currently proposed site of the ILC can accommodate an accelerator providing 1 TeV energy by making the ILC longer. By that time, other more ambitious accelerator technologies such as CLIC or plasma acceleration may become viable. ILC is expected to be a long-term facility, even beyond the anticipated twenty years of the current running scenario. Hitoshi Murayama is Deputy Director of the Linear Collider Collaboration.